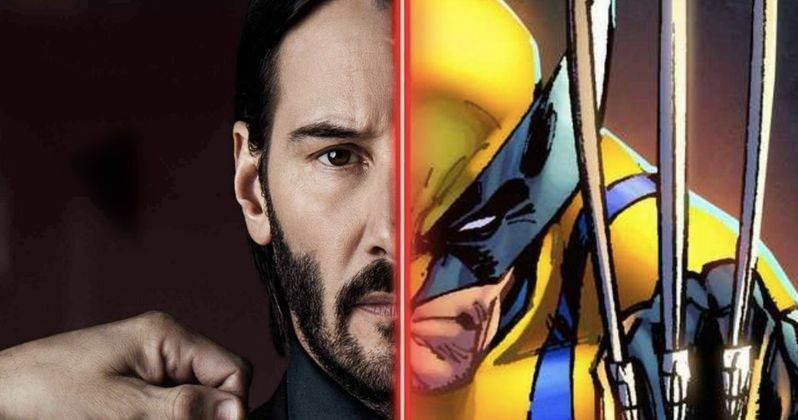 Keanu Reeves has been transformed into Wolverine in some incredible new fan-art. The actor is gearing up for the release of John Wick 3 next year and he recently revealed in a new interview that if he had to choose between playing Batman or Wolverine on the big screen that he'd choose to go the Marvel route, noting that he'd "love" to play the character. Obviously, Reeves was asked to choose and he isn't actively seeking to replace Hugh Jackman, even though he would make for a pretty badass version of the iconic superhero. After Keanu Reeves' comments started to spread around the web, a Marvel fan by the name of Spdermnkyxxiii decided to take action. The artist admits that the Wolverine piece only took him about 30 minutes, but it's still pretty good. Instead of the famous yellow and blue costume from the comics or the suits from the X-Men movies, we see Reeves in street clothes and the famous sideburns, along with the trademark adamantium claws ripping through his hands, ready to strike. Marvel fans are anxiously awaiting to see what will happen when the Fox and Disney merger is officially complete next year. The Fox properties like X-Men and Fantastic Four will be eligible to join the Marvel Cinematic Universe, which will see a new actor in the role of Wolverine. While Keanu Reeves would be an excellent choice, it doesn't seem like the 54-year old actor will really jump back into the world of comic book movies, though a role in the MCU could end up being pretty enticing for him. Currently, Keanu Reeves is the face of the John Wick franchise. The third, and what was once believed to be the final, installment hits theaters next year. Director Chad Stahelski recently revealed that he and Reeves have a ton of ideas to keep the franchise moving forward, which could include Reeves as the infamous assassin some more. Stahelski says that he wants the franchise to go on "indefinitely," but noted that it will ultimately be up to the fans as to how far they go with the John Wick character. Basically, if John Wick 3 is a hit, we'll likely see another installment at some point. As for who will take over Hugh Jackman's run as Wolverine, that is unclear at this time. Ryan Reynolds wants Jackman to return with Deadpool, and fans would love to see that too, but it probably won't ever happen. Marvel fans are going to have a tough time excepting someone new in the role after Jackman did it for so long and did it so well. But, the franchise has to move on and a new actor will have to be selected at some point. While we wait to see how everything pans out, you can check out Keanu Reeves as Wolverine below, thanks to Spdrmnkyxxiii's Instagram account.